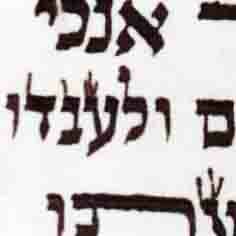 I'm looking for a psak on this yud, which is clearly lacking guf ( the only guf is the "kotz R'T)? And if it's kosher, is it mehudar after tikkun? Reb Moshe, what do you think? Is someone able to show this to Rav Friedlander next time they visit him? (Yehoshuah, Yerachmiel, Pesach)? R. Eli, will be very interested to see what others say on this. If I'd come across it I would most likely pasul it as I can't imagine a child (or anyone) reading this as a yud - looks more like a pictogram of a baby bird opening it's mouth for food. S'fakot hasofer doesn't bring this form - I guess it's too extreme. It is clearly lacking a guf, so there is no tzuras ois there. In regard to tikun, probably it is taluy in the machalokes of a yud without regel, the AR forbids tikun, and the Tzemach Tzedek is matir to fix. The same should apply here. What I mean is what halachic geder / hagdara is it AFTER tikkun - ie bedieved / lechatchillah (certainly not mehudar I should think)??? The question is what is the Tzemach Tzedek's svara in his case - lechatchila or bdieved? It seems he hold the yud perfectly kosher, after the tikun. But I am reluctant to say so [because of the all out machalokes, and maybe this yud is worse]. 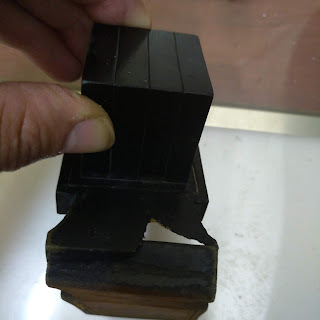 OK so bottom line - and I needed an exact hagdara because that is what I was asked by the customer- to find out from a posek: These tefillin, even after tikkun, are not mehudar. Correct? This looks like the Yud from here in the word בני. I immediately thought that the Yud was not good, but if "It turned out the sofer asked a few poskim in Israel and came to the conclusion that the yudim were kosher", so who am I to say otherwise. And to R. Moshe, I don't think that what the Tzemach Tzedek writes about the Yud without a regel is שייך in this case. 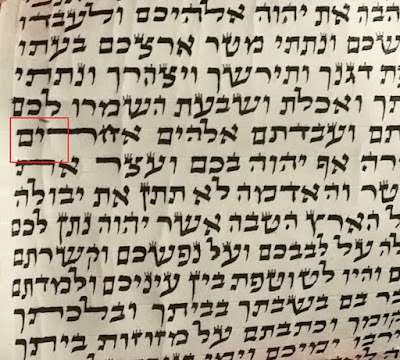 I have this theory (that I still have to look in to it) that what the Tzemach Tzedek writes about the regel of the Yud, has something to do with the מחלוקת between רש"י and ר"ת regarding what is considered the קוצו של יוד. Sholom, you are correct, it is from that case. I didn't have time over recent weeks to follow it up (other than discussing it on the phone with one rov briefly). The whole yud / Tzemach Tzedek thing is a massive chiddush, and such a leniency is unheard of outside Chabad circles. Some say it is even a printing mistake. I agree to both what you have said, and that is why I wrote "maybe this yud is worse". Still I think that according Tzemach Tzedek, the basic issue is - if a tinok can read this letter, then it may be fixed. The problem as R. Eli wrote - relying on the Tzemach Tzedek against AR and most acharonim, in a case that he didn't clearly matir is quite uncomfortable. To me this almost looks like a rudimentary gimel. Based on the image provided I'd never know this was a Yud and I'd not be machsir it.